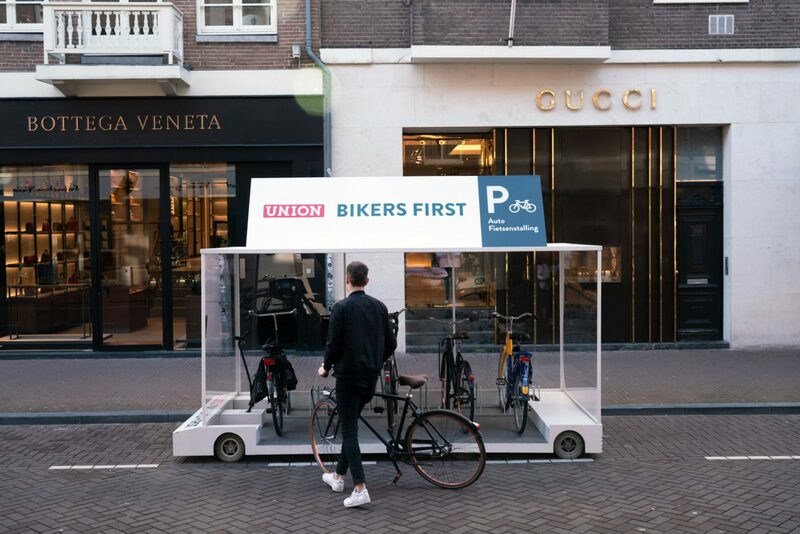 Famous Dutch bicycle brand, Union, has launched a pop-up installation to replace an ordinary paid parking spot for cars in Amsterdam’s poshest shopping street with parking space for eight bicycles. There’s no doubt about it: the Netherlands is a bicycle nation. The famous Dutch bicycle brand, Union, wants this to remain true in the future. However, there are still too many parking spaces for cars instead of bicycles, according to Union. That’s why they came up with a creative solution, teaming up with ad agency Natwerk. Union and Natwerk designed a bicycle parking facility that takes up exactly one conventional parking space. 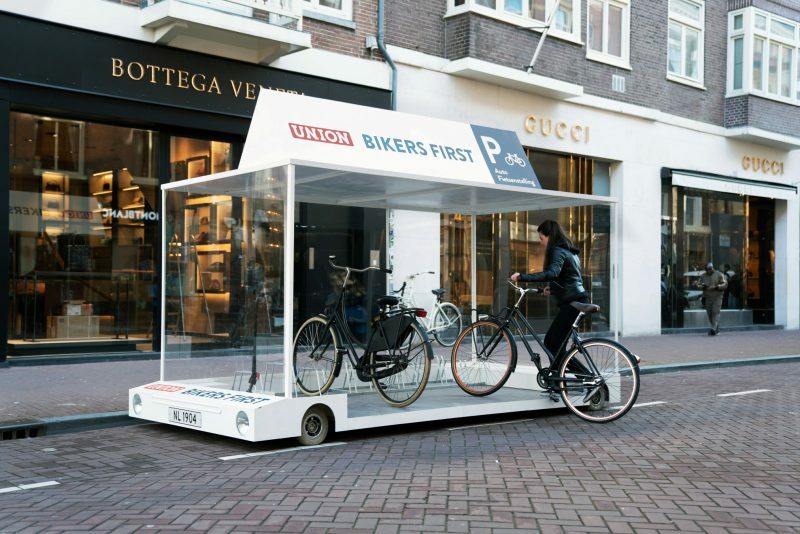 The pop-up bicycle parking shed fits up to 8 bicycles, and is equipped with a roof, wheels, and a legal Dutch number plate that is registered to it. Since parking in Amsterdam requires number plate details in the payment process, the mobile bicycle parking is able to be legally parked anywhere in the city for the price of parking one car — which is currently €4 per hour in the city center. Its first public appearance was in the PC Hooftstraat in Amsterdam — home of Chanel, Burberry and Hermès, that is known for shoppers showing up in expensive SUVs and premium sedans. Obviously, a high-end shopping street where bicycle parking is a scarce resource is the perfect place for some bicycle propaganda. Its next location is yet to be uncovered. Besides its local impact, this pop-up bicycle parking shed has proven that urban transformation can be easy to achieve at minimum costs. All you need is a simple construction on wheels, registering and attaching a number plate to it, holding your contactless debit card up to the local parking meter, and you’re done. Whether it’s urban green or improved cycling conditions, change can be easier to achieve than you might think. Most of our surroundings are designed for sitting down, but what if we stood up? The End of Sitting by studio RAAAF and visual artist Barbara Visser is a large-scale installation which explores ways to work standing up. Seeing an opportunity to unite the wide-ranging efforts of urban farmers worldwide, CITIES Magazine and Trancity have published Farming the City: Food as a Tool for Today’s Urbanization. Farming the City’s mission is to link international activists and thinkers to increase their potential for positive impact on society, actively ‘joining the dots’ between independent initiatives around the world. Farming the City provides a platform for knowledge-sharing, motivation and inspiration for the diversity urban farmers worldwide. 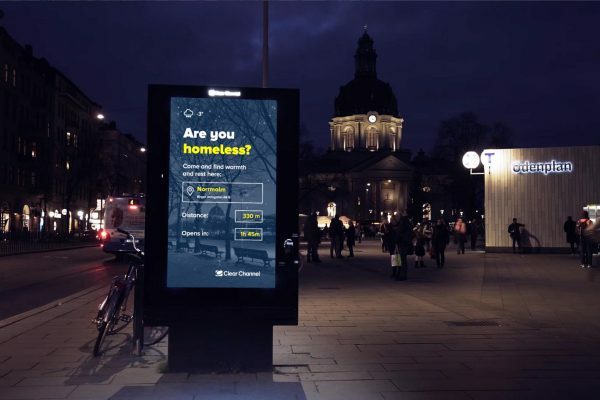 A number of digital billboards throughout Stockholm now showcase flashy ads with directions to the nearest shelter for the homeless.